When drilling a hydrocarbon well a quantity of the applied drilling fluid enters the formation through its pore system, and meanwhile the solid content forms a coating on the wellbore surface. This phenomenon (filtration) describes the reduction of initial permeability of the formation and thus lower productivity of the well. The investigation of the effect of drilling fluid on the formation is essential, since one of the main roles of the drilling fluid is to protect the productivity of the hydrocarbon bearing formation. While the API standard filtration tests cannot provide information about the permeability alteration caused by the drilling fluid, our new method is capable of doing so. The measurements are applied on standard core plugs of comparable petrophysical properties, under identical reservoir conditions. Besides determining the scale of permeability alteration, the main goal of the current investigation is the determination of the time dependency of filtration. Deep drilling is carried out for hydrocarbon research and/or production, in order to transfer hydrocarbons from the depths or to collect geological and reservoir information. Therefore, during the entire program, the presence of a pre-designed and appropriately adjusted drilling fluid is necessary. Drilling fluid is a physical, chemical and rheological substance which is largely liquid-based. Drilling mud must meet numerous expectations, as the drilling operation is a complex system with numerous interactions between the different components. The highly developed drilling technologies often need special fluids (Jayanth and Ziaja, 2011), which must ensure the transport of cuttings to the surface, cooling of drilling bit, lubrication of drill string, achievement of an anti-corrosion effect, protection of the hydrocarbon bearing formation and provision of adequate back pressure (Salih and Bilgesu, 2017). Beyond technical aspects, its effects on the environment must be kept to a minimum; furthermore, conditions such as economy and cost-effectiveness must also be met. It is clear, therefore, that drilling mud plays an important role during deep drilling process, since in addition to its primary task it might influence the forward speed of drilling, sticking of tool or fluid loss, as well. Well-chosen mud helps to overcome problems emerging during the process of drilling, such as instability of the open hole, torque decreasing or disintegration of cuttings (Al-Zubaidi et al., 2017), which might aid well completion or cementing. Among the criteria for the drilling fluid, besides the high priority of safety, is the minimisation of formation damage, particularly during operations in hydrocarbon bearing formations. Therefore, in drilling fluid design, formation damage minimisation must be enforced. During deep drilling a certain amount of outflowing drilling fluid enters the formation, and during this process it forms a thin low permeable layer on the wellbore called filter cake. In the cases of both overbalanced and balanced drilling, the fundamental problem is the extra costs from losing the filtrated drilling fluid as mud losses; furthermore, production capacity of the well is reduced by mud contamination. Since filtration will take place in any event, during operation process the aim is to minimise the damage caused by outflowing mud. The performance and extent of formation damage can be controlled and verified by filtration analysis. Typically, filtration analysis takes place on test materials such as filter paper or ceramic discs. However, it must be considered that the results from this kind of tests do not take the characteristics of the geological formation into account. Thus, in such cases the test could be misleading, since it inadequately simulates bottom-hole conditions. We have developed a new method to increase knowledge of the process of filtration phenomena. The essence of this work is to carry out filtration test on a real natural core sample instead of model media. This is the reason why we designed a new measuring cell, to allow measurements to be made on plugs used in oil industry. The main advantage of this newly invented measurement method is that it providesthe opportunity to examine the rate of permeability degradation caused by mud contamination besides the standard data obtained. The intention in the present study is to explore the time dependence of both the filtration process and the formation damage. This may be helpful in order to develop a uniform measurement protocol for filtration tests implemented on core plugs, as well as providing information that could lead to a better understanding on the impact of drilling fluid on the formation under bottom-hole conditions. According to the literature and common practice the filtration test is carried out on filter paper or a ceramic disk. The API standard Fluid Loss Test can be performed at both low temperature and low pressure (LTLP) and high temperature and high pressure (HTHP) conditions. The LTLP test runs with ambient temperature fluid and 100 psi differential pressure, while the HTHP test runs with optional parameters modelling the bottom-hole conditions. A standard filtration test apparatus can heat the drilling fluid up to 149 ˚C (300 ˚F), but normally the test runs at T = 65 ˚C (150 ˚F); while the differential pressure is usually 34.74 bar (500 psi). The duration of a filtration test is 30 minutes in both low and high circumstances with filtration paper or a ceramic disc. If the tested drilling fluid has proper fluid loss features, at the end of the measurement a thin (maximum 2 mm thickness) non-permeable filter cake evolves on the surface of the model medium (filtration paper or ceramic disk) (API RP 13-B-1). Although the standard filtration test is widespread and provides quick and reliable basic information about the filtration volume, it has some well-known disadvantages as well. Neither the filter paper nor the ceramic disc can model the real rocks around the wellbore. The real bottom-hole conditions are difficult to reproduce: the in-situ permeability, porosity, saturation and pore-size distribution can never be modelled using conventional procedures. While conventional procedures are a useful and simple solution for the mud engineer to describe and comparethe behaviour of different muds under lab conditions, they cannot represent real cases. Hence, a new method is required to reach a better estimation of filtration volume, to predict the formation damage, and to obtain more information about the behaviour of the drilling fluid on bottom-hole conditions. Therefore, a new measurement procedure was developed (Varga et al., 2018); the essence of it is to use real rock samples instead of filtration paper or ceramic disks. In that way not only will the filtration volume represent values closer to the real wellbore values, but data on formation damage will also be available for examination by repeating the permeability measurement after mud contamination (Rahman and Marx 1991; Jiao and Sharma 1992; Liu and Civan 1994). The construction of the sample holder and the modified cell can be seen in Figure 1. Figure 1: The invented measuring cell with the inner core sample holder compatible with the OFITE 17-50-1 apparatus. As the traditional core plugs used in the oil industry fit into the new inner sample holder, the samples can be used without any further preparation needed after performing the basic petrophysical measurements (porosity, absolute and effective permeability). Figure 2 illustrates the procedure of a filtration test on a core plug. After the porosity and absolute permeability values (measured by gas) are determined, the sample is saturated by artificial formation brine, then the effective permeability measurement is carried out (Stage I) according to the API-RP 40 standards. In the second step the filtration test is carried out with the flow of drilling fluid in the opposite direction, as occurs in a real bore hole. 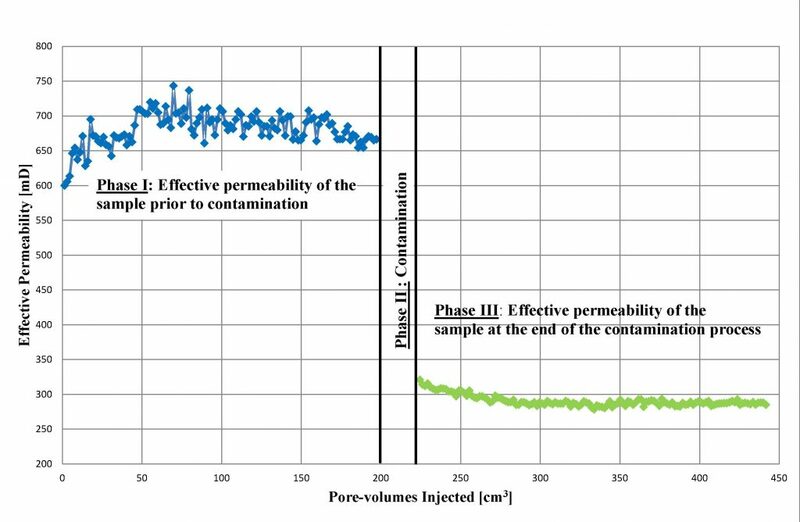 In the last step (Stage III) the permeability of the contaminated sample is measured with artificial formation water in the same flow direction as in the first step in order to determine the permeability reduction caused by the drilling fluid. Figure 2: Schematic figure of the measurement process on the natural core sample (d= 3.75 cm). As we wanted to simulate bottom-hole conditions, the test was run at formation temperature (94 ˚C; 201.2 ˚F) and 15 bar (217.55 psi) differential pressure in static state. These conditions are present when drilling a common hydrocarbon bearing formation or at a static open hole. For the filtration tests the drilling fluid was prepared in the laboratory according to the recipe shown in Table 1. First the necessary water was measured into the mixing tank, then the necessary amount of barite and bentonite was added with continuous mixing at a rate of 15-20 g/min. After adding the caustic soda (dissolved in advance) and the remaining additives, the fluid was mixed for 30 minutes by a Chandler Engineering 30-70-1 mixer at a speed of 4000 s-1. Table 1: Additives of water based drilling mud. The basic rheological examinations were carried out on the mixed fluid (API RP 13-B-1), at ambient temperature (22 ˚C; 71.6 ˚F) and atmospheric pressure (1012 mbar; 14.68 psi) by a Fann 35 rotational viscometer (Table 2). 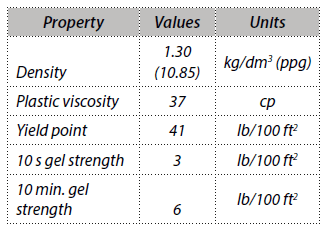 Table 2: Rheological parameters of the drilling fluid (25 ˚C; 1012 mbar). The finely distributed quartz-rich sandstone core samples originate from a Hungarian sedimentary basin, from the depth of 1,900-2,100 m (6,233-6,890 ft). The cores should be made uniform for normal permeability measurements. The core samples are drilled out from the original core and are prepared for measurement. The flow direction for the permeability tests was selected according to the normal flow direction in in-situ conditions. In the course of the sample selection the aim was to create a group of core plugs with similar petrophysical properties (porosity and permeability), especially effective permeability (measured by artificial formation brine). The porosity and permeability measurements followed the normal API standard procedures (API RP 40). The selected samples are listed with their petrophysical parameters in Table 3. 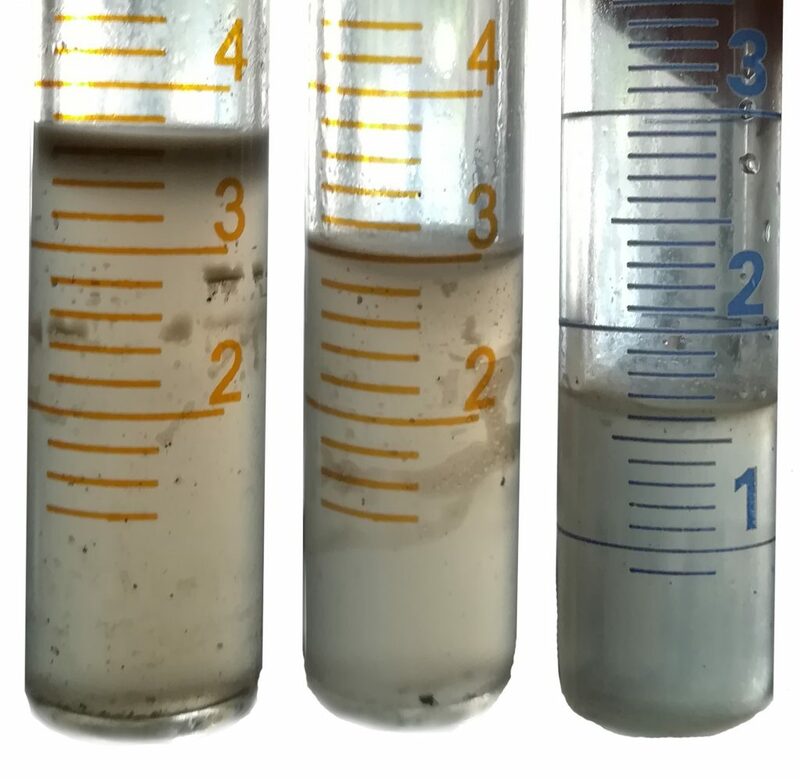 All samples belong to a permeability interval of 697–936 mD, which are considered very high values, so that the permeability degradation caused by the contamination of the drilling fluid would be more evident. The number of the selected samples is not suitable for a statistical examination; nevertheless, the aim of the recent investigations is to examine the time dependence of the permeability decrease by the filtration test in order to set up a proposal for the optimal measurement protocol. 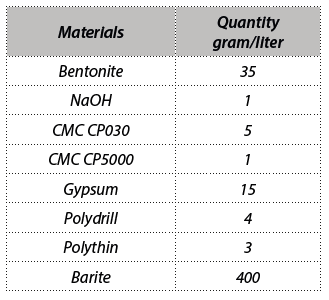 Table 3: Petrophysical data of the natural sandstone samples. The samples are in a tight interval of petrophysical properties (porosity and permeabilities), although naturally the values are not identical. The similarity in properties makes it possible to compare measurements carried out in different time frames. The time needed for filtration through a sample depends on the wet porosity volume (Vpore(wet)) of the sample, and this parameter was used to determine the necessary time intervals for each measurement. Accordingly, the longest time frame was the necessary time to produce filtration volume, which is the equivalent of 100% wet porosity volume (Sample 1 was used). Then the measurements were run for the time frames of Vpore(wet) = 75%, 50% and 25% equivalent filtration volume on the remaining samples. Compared to the previous measuremnts (Varga et al., 2018) carried out in lab conditions (API RP 13-B-1), in this study formation temperature and deferential pressure conditions were applied that match the characteristics in the bore hole. This led to results better reflecting real conditions prevailing during the drilling process. 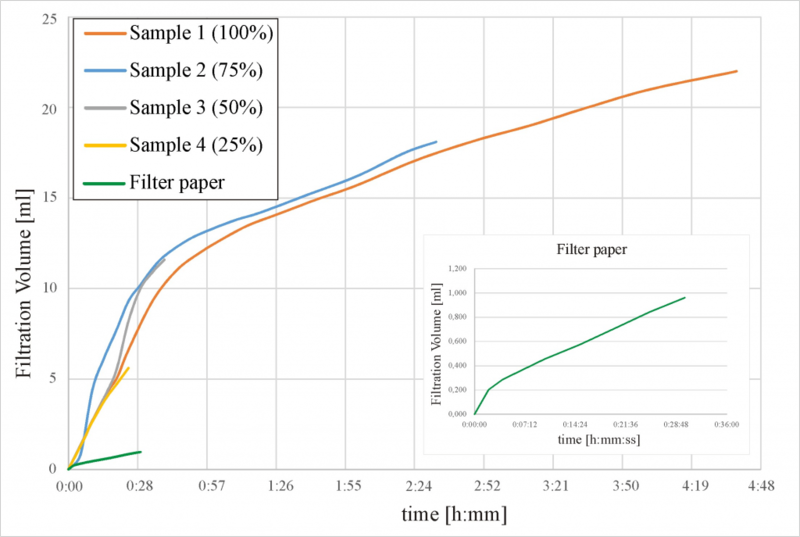 The results of the filtration tests are shown in Figure 3 in terms of the filtration volume as a function of measuring time for core plugs and filter paper. The standard filtration test with filter paper was run for 30 minutes at 6.97 bar (100 psi) pressure and 25 ˚C (77 ˚F) temperature. The resulting filtration volume (5.7 ml) is valid for the 9 cm (3.54″) diameter, which has to be converted to the core plug diameter 3.75 cm ± 0.05 cm (1.476″ ±0.02″). The filtration volume of the filter paper with this conversion (0.96 ml) is now comparable to the core plug results. Figure 3: Comparison of filtration volumes of the examined core samples and filter paper at different equivalent filtration volumes. As Figure 3 presents, the curves of the filtration volume have two sections in both cases: an initial, steeply increasing section, and after a breakpoint a moderately and evenly increasing second section begins. The initial part of the curve represents the spurt loss phenomenon, when the drilling fluid passes unhindered through the filter media because of the lack of filter cake. In that part of the measurement, the filter cake does not exist or is in a very primitive state and is unable to prevent the drilling fluid from permeating the medium. The breakpoint of the curve is the starting point of the state change, when the filter cake starts to become impermeable and is able to restrain the drilling fluid. The second section of the filtration volume curve represents the stabilised low fluid flow through the filter cake and the filter media. In the case of the core plug, these stages occur at a slower rate compared to the filter paper. W ith the filter paper the development of the filter cake is quite fast, so the break point of the curve appears basically right after the beginning of the measurement (Figure 3), while for the core plug this process is much slower. The most presumable cause of this phenomenon is the difference between the filter media. The core sample has a significant volume with a certain percentage of pore volume which is a quite appropriate flowing channel for even the dry matter of the drilling fluid. Thus, the core plug is acting like a buffer zone until the filter cake becomes mature enough to prohibit the drilling fluid from entering the core in a significant amount. 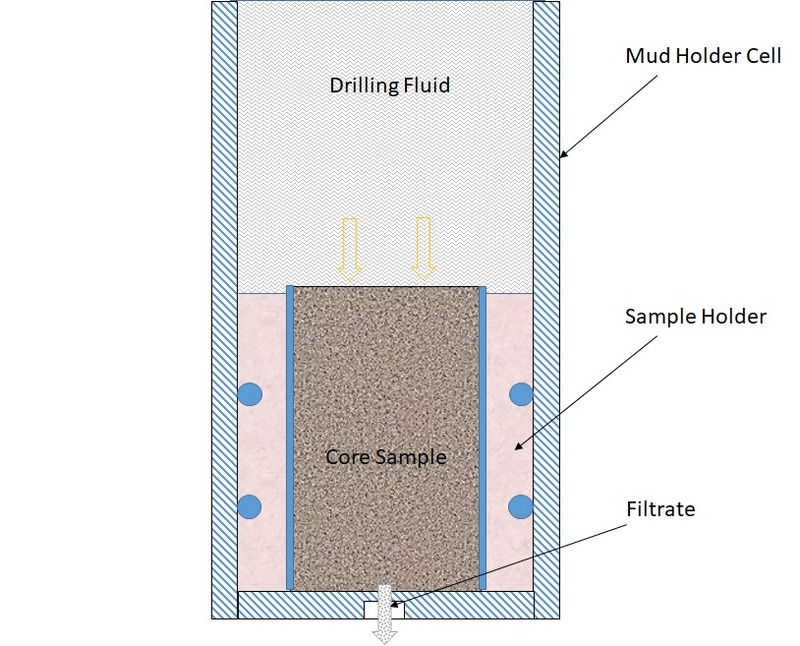 The visual observation of the filtration volume (Figure 4) helps to confirm this phenomenon, since the initial fluid flowing through the sample came with a notable amount of dry matter derived from the drilling fluid. With time, the filtration volume clears up, showing the sealing effect of the filter cake. However, it should be noted that in the course of the previous examination (Varga et al., 2018) with lower permeability values (24–165 mD) and LTLP conditions the filtration volume was clear from the beginning of the test. Accordingly, the test circumstances (higher T and P) and the larger pore throats connected to the higher permeability contributed to the appearance of the mud particles in the filtration volume. Figure 4: The increasingly clean filtration volume of Sample 1. There is a difference between the characteristics of the filter cakes produced by the standard test and the test with core plugs. On the surface of the filter paper a loose textured 1.2 mm thick filter cake formed. On the surface of the rock samples the thickness of the cake depends on the elapsed time. In the case of Vpore(wet) = 25% equivalent filtration volume the filter cake does not even form; with increasing measuring time (Vpore(wet) = 50%, 75%, 100% equivalent filtration volume) a two-layered filter cake developed. The upper layer (contacting the drilling fluid) is around 1 mm thick and is a loose textured, gelatinous material, while the lower layer (contacting the core sample) is a 4–6 mm thick, more consolidated, fabric-like textured material. This phenomenon was also observed by Mahmoud et al. (2018) with filtration testing on core samples. Further information can be obtained by remeasuring the contaminated rock samples. As Figure 5 shows, after the filtration test the core samples were re-measured by artificial formation water in the direction of the natural flow. As figure illustrates, the permeability deterioration is significant in the case of Sample 1. This is typical for the other samples as well; results are presented in Table 4 in percentage form for each sample. According to the data, the permeability deterioration occurs to nearly the same degree in the cases of Vpore(wet) = 25%, 50%, 75% and 100% equivalent filtration volume. This means that the first stage of the filtration process (spurt loss, without filter cake) is responsible for the permeability deterioration, namely the formation damage. Moreover, as the permeability remeasurement shows (Figure 5), the damage is not reversible by normal formation brine flow. Table 4: Petrophysical parameters of the core samples before and after contamination. Figure 5: Effective permeability of Sample 1 before (phase I), during (Phase II) and after (Phase III) contamination. The results of the time dependence of the filtration process allow us to set up a proposal for the optimal filtration test protocol for measuring with core plugs. The permeability deterioration results show that it is sufficient to run the filtration test until the Vpore(wet) = 25% equivalent filtration volume. However, the filtration volume curve shows that in that case (Vpore(wet) = 25%) the filter cake did not develop, while in the case of Vpore(wet) = 50% it already exists and performs its task, blocking the flow of the drilling fluid. Taking into account these findings it is recommended to run the filtration test until the Vpore(wet) = 50% equivalent filtration volume is produced; the measuring time depends on the petrophysical properties of the rock core. The newly invented measuring cell proved to be compatible with the OFITE 17-50-1 filtration test apparatus and works safely not just at LTLP conditions (Varga et al., 2018) but at HTHP conditions as well. As both previous (Varga et al. 2018) and recent measurements (Figure 3) show, the filtration volume curve can be divided into two sections, displaying the different parts of the filtration process (spurt loss, breakpoint, stabilised state). The most important difference is the filter cake development rate, which is much slower in the case of measurements made on core plugs compared to the conventional paper filters. It is important to note that this slower rate is closer to the process taking place at real bottom-hole conditions. Consequently, with this filtration test apparatus more realistic and useful information can be obtained about the behaviour of the drilling fluid in an open bore-hole section. Our findings show that this method of measurement allowed us to determine not only filtration volume and filter cake properties but also the permeability degredation of the core plugs. Results show that even during the shortest measuring time (Vpore(wet) = 25% equivalent filtration volume – 25 min) the permeability deterioration was equal to that present in the longest time frame (Vpore(wet) = 100% equivalent filtration volume – 4 h 38 min) (Table 4). The formation damage to the core plugs was irreversible in all of the examined cases (Figure 5). Taking all the results into consideration, it is recommended to run the filtration test on core plugs until the Vpore(wet) = 50% equivalent filtration volume is produced. For the recently selected sample group (porosity = 30.95 – 33.12 %, permeability = 697 mD–936 mD) the time required was around 40 minutes. The measuring time always depends on the petrophysical properties of the examined core plugs and should be determined for each rock core individually. As this study is just one stage of an ongoing project, further investigations are planned. The main goal at this stage is the testing of the invented measurement method with different drilling fluids in static conditions, on rock samples derived from the same natural reservoir with similar petrophysical properties (for better comparison). At a further stage, tests using (water-based) drilling fluids containing nanoparticles will be the focus of interest. Finally, to reach the most realistic drilling/bore hole conditions a filtration test under dynamic and HTHP conditions is planned. The research was carried out in the framework of the GINOP-2.3.2-15-2016-00010 “Development of enhanced engineering methods with the aim at utilization of subterranean energy resources” project of the Research Institute of Applied Earth Sciences of the University of Miskolc in the framework of the Széchenyi 2020 Plan, funded by the European Union, co-financed by the European Structural and Investment Funds. Al-Zubaidi N.S., Alwasiti A. A., Mahmood D. 2017. A comparison of nano bentonite and some nano chemical additives to improve drilling fluid using local clay and commercial bentonites. Egyptian Journal of Petroleum, 26(3): 811-818. API RP 13-B-1. 2014. Recommended Practice for Field Testing Water-Based and Oil-Based Drilling Fluids (4th ed). American Petroleum Institute. API RP 40. 1998. Recommended Practices for Core Analysis. American Petroleum Institute. Varga G., Koncz Á., Fiser-Nagy Á., Jobbik A. 2018. New method for formation invasion analysis using artificially consolidated core samples. 18th International Multidisciplinary Scientific Geoconference SGEM, Albena, Bulgaria, pp. 641–648.